Casanova Gelato | The Red Brunette. For this week's blogpost I was planning on sharing some type of restaurant or food with ye but I had no clue where to go. But last Saturday I was in town with my friend Hazel after going to the Shandon Street Festival when we decided to visit one of my favourites, Casanova Gelato. Luckily enough I had my camera with me so I decided to take a few photos and share my favourite places to get ice cream in Cork with ye today. Last year I did a blogpost all about the hidden gems in Cork (click here to read it) and to my surprise loads of people still don't know about this place. The place I'm talking about is Casanova Gelato, a gelato shop tucked away form the madness of the city on Georges Quay (just up the road from Cafe Vélo and before you get to Sober Lane). I think it's the only dessert place in Cork now that Paradise Crepe and Gino's closed down. 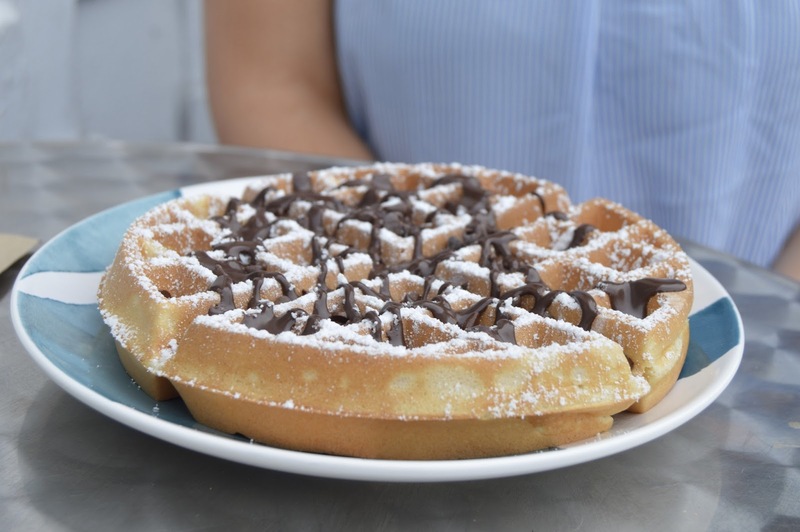 Not only do they do gelato, they do waffles, crepes, croffles, milkshakes and sundaes. I would usually get some of their gelato but I went wild on this visit and decided to finally try out their waffles and I was not disappointed. You can choose from a wide range of different toppings and sauces along with their different flavours of gelato. Everything is reasonably affordable too which is fab. I of course added a scoop of gelato on top, with my sweet tooth. I got white chocolate sauce and coconut on top along with some vanilla gelato. Hazel went for choco drops and a chocolate hazelnut sauce that is just like a thinner version of nutella. Their gelato is absolutely incredible. As my Italian friend Stefanie said, it's the best gelato she has ever had outside of Italy so that's definitely a good sign. They have a mixture of sorbets and gelato and some of these are vegan as well which is fab. A flavour that they have which is quite different is this bright blue gelato called Spiruli that uses spirulina algae which is a type of seaweed. It obviously doesn't taste bad it tastes like caramel, definitely one to try out. The day we went it was a really sunny day so there was a queue out the door but it moves quickly enough so don't be scared if you see a crazy queue. There is seating both inside and outside and even if it is busy you are more than likely to get a seat quick enough which is great. Please let me know if there are any other food places in Cork that you think I should try or do a blogpost on. Definitely check out Casanova Gelato if you have never tried it before.